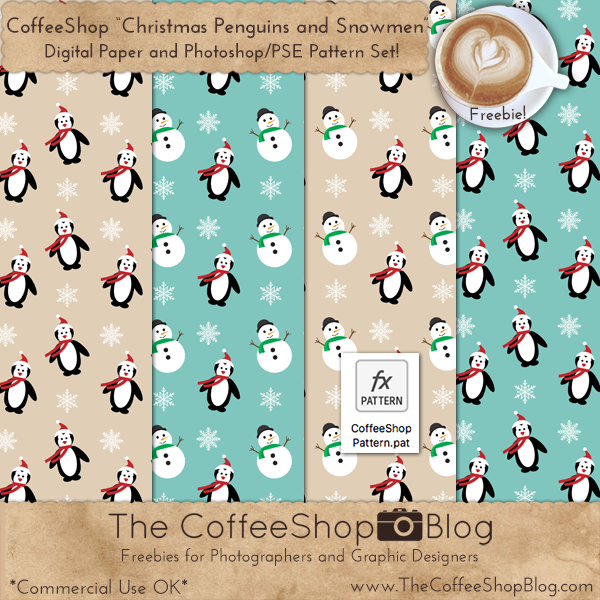 The CoffeeShop Blog: CoffeeShop "Christmas Penguins and Snowmen" Digital Paper and Pattern Set! CoffeeShop "Christmas Penguins and Snowmen" Digital Paper and Pattern Set! I just realized I need to get my Christmas designs out there before it is too late. We haven't even decorated our tree, hung lights on our house, or finished our Christmas shopping. This month is just flying by already and I have so much to get done! Today I have a cute little Christmas Penguin and Snowman digital paper set and Photoshop/PSE pattern you can use to design your own custom designs. These papers and patterns can be used commercially, no attribution necessary. Download the CoffeeShop "Penguins and Snowmen" Digital Paper and Pattern Set! So adorable. Thanks Rita. I always love when you include patterns and the links to the original images as well! So very much appreciated. We too have done absolutely nada yet and the big day will be here before we know it. If only there was a pause button with time, eh?! Good luck getting all your tasks done before Christmas. Oh Lisa, I need that pause button. Especially when life is going just perfectly! And you are so welcome, I always try to include as much info as I can for each post.